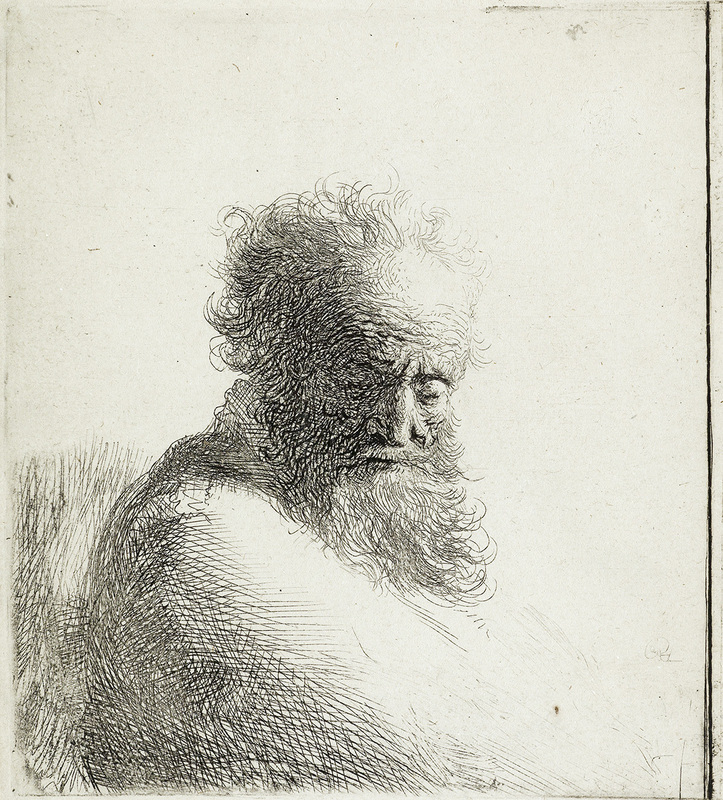 This guest post was written by a Prints & Drawings Senior Specialist. Two of the top lots in our March 2 sale of 19th & 20th Century Prints & Drawings are portfolios, each considered to be among the most important print projects undertaken by their respective artists. Marc Chagall’s Four Tales from the Arabian Nights and Édouard Vuillard’s Paysages et Intérieurs represent the pinnacle of the artists’ printmaking in both form and content. Exceedingly scarce, these portfolios are rarely seen as complete sets at auction. In particular, these sets are especially remarkable as they both contain additional prints: Arabian Nights is one of the deluxe editions (of which there were only 11) that was issued with an additional lithograph; and Paysages contains two additional scarce proof impressions of the subjects as well as an impression of a lithograph from the same year that the portfolio was issued. 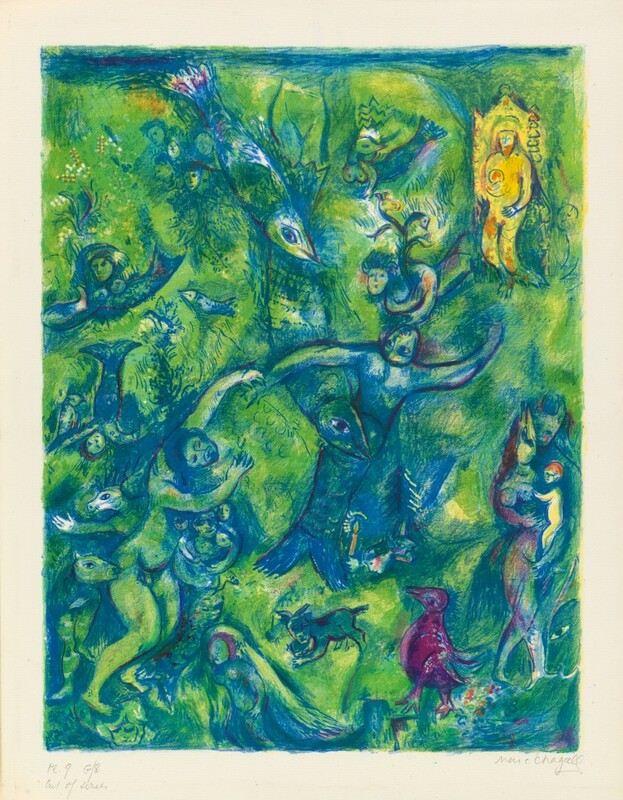 Lot 551: Marc Chagall, Four Tales from the Arabian Nights, Plate 13, complete deluxe edition of 13 color lithographs, New York, 1948. Another remarkable aspect of these two portfolios is that they are both entering the market for the first time, having been in private collections for many years. 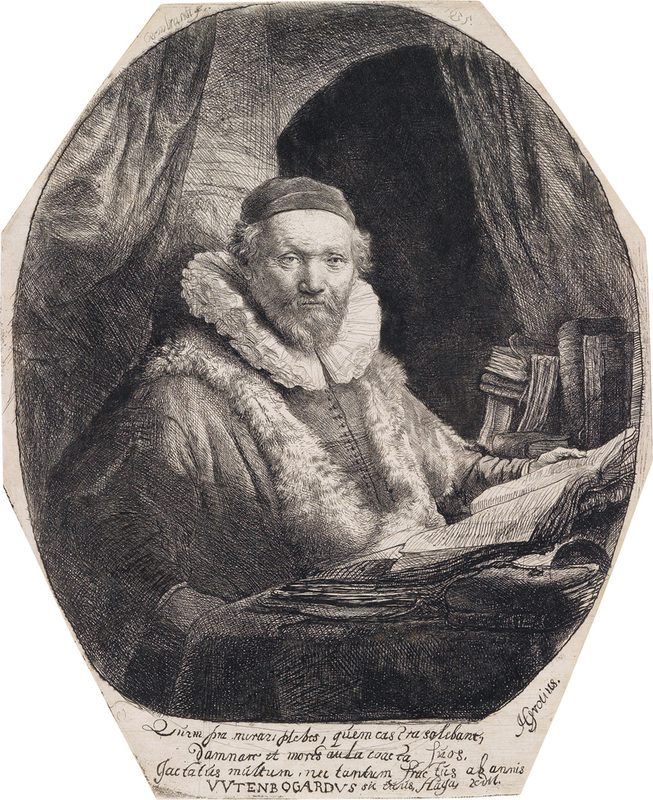 Their provenance histories are well-documented, with direct connections to the artists. This set of Paysages et Intérieurs was in Vuillard’s personal collection and passed at his death to his brother-in-law, the artist Ker-Xavier Roussel (1867-1944), thence to Roussel’s son (Vuillard’s nephew) Jacques Roussel in 1944. 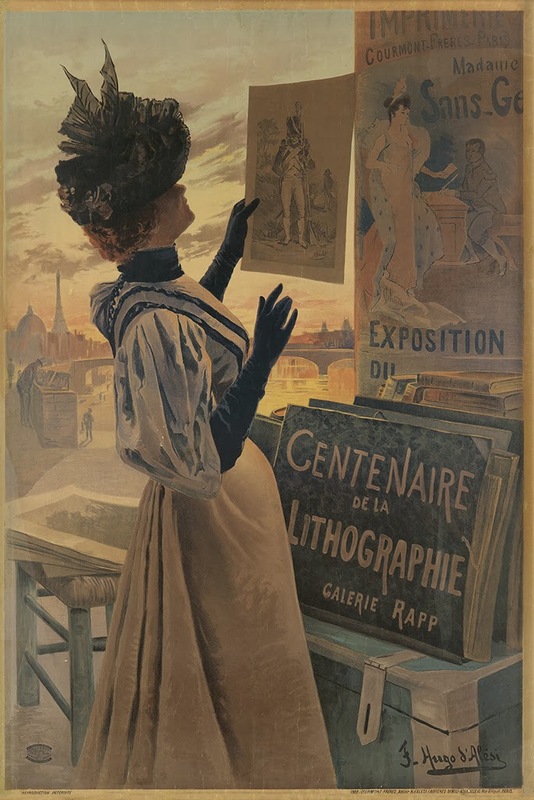 Jacques Roussel sold this set of color lithographs, along with some pastels by Vuillard, to a French private collector in the 1950s, and thence by descent it came to the current owners. 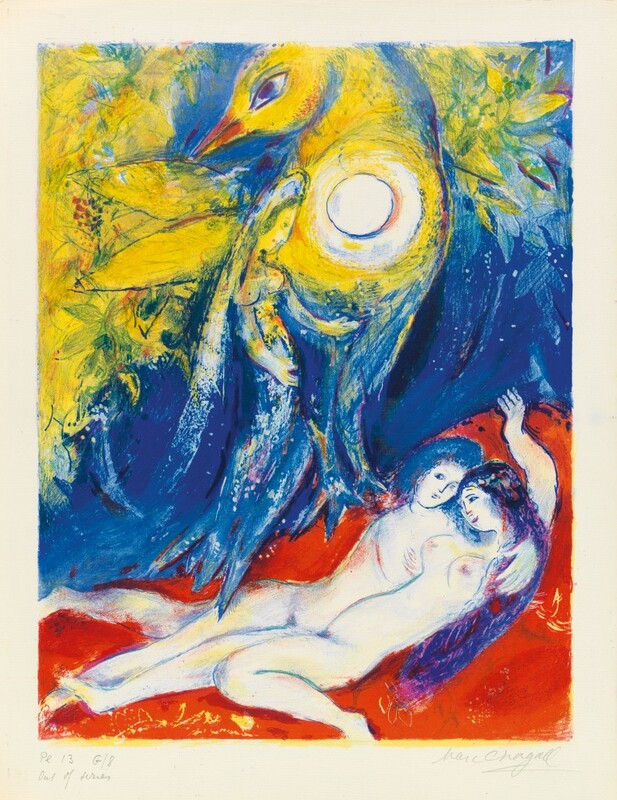 As for Chagall’s Arabian Nights, it was the personal set of the publisher, Kurt Wolff of Pantheon Books, and has been passed down by descent to the current owner. The intimate association that these two lots have with the artists is evidenced by their extraordinary quality. 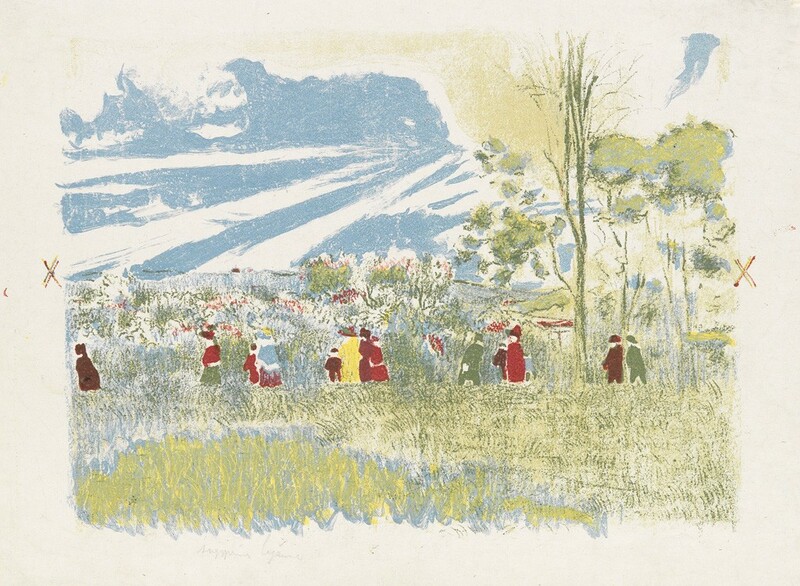 Lot 197: Édouard Vuillard, A travers champs, from Paysages et Intérieurs, complete portfolio of 13 lithographs with two additional proofs, 1899. Estimate $150,000 to $200,000. Édouard Vuillard (1868-1940) studied art at the Académie Julian and the École des Beaux-Arts from 1886 to 1888. During his studies, Vuillard met the artists that he would collaborate with to form Les Nabis, a brotherhood of young, rebellious artists established in 1888 (Pierre Bonnard and Maurice Denis are two other noted artists to emerge from the group). Les Nabis (meaning “prophets” in Hebrew) rejected the use of Renaissance perspective and were instead inspired by the decorative arts and traditional Japanese Ukiyo-e prints; they embraced two-dimensional surface patterns and unimpeded areas of pure color. 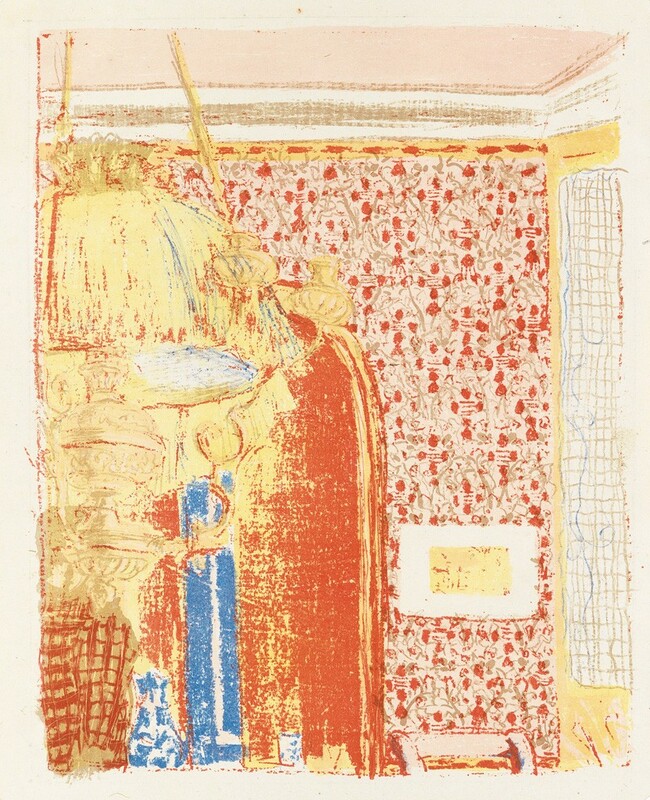 Lot 197: Édouard Vuillard, Intérieur aux tentures roses II, from Paysages et Intérieurs, complete portfolio of 13 lithographs with two additional proofs, 1899. Vuillard made some of his most well-known works while directly involved with Les Nabis, focusing on figures in warm, ornate interiors filled with complex patterning. The figures in these scenes frequently blend in with the décor, creating a decorative homogeneity which covers the picture surface. Vuillard once stated that he does not paint portraits, rather that he, “Paint[s] people in their surroundings.” Paysages et Intérieurs, published by the Parisian art dealer Ambrose Vollard (an important publisher of lithographs and livres d’artiste in the 1890s, and a leader in the revival of fine art printmaking), contains masterful, vibrant depictions of Parisian domestic scenes. The colors and compositions epitomize the artist’s affinity for ukiyo-e woodblock prints with their unusual and intimate viewpoints and exaggerated colors. 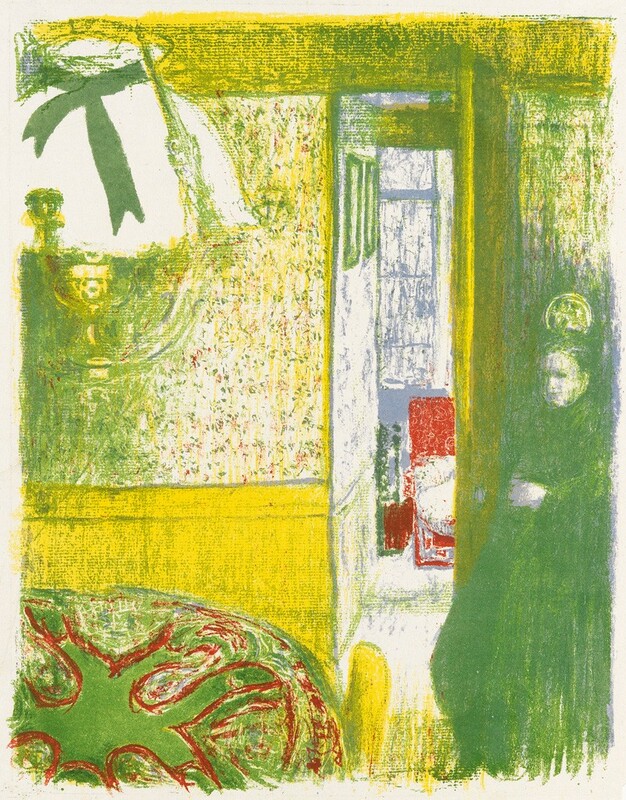 Lot 197: Édouard Vuillard, Intérieur à la suspension, from Paysages et Intérieurs, complete portfolio of 13 lithographs with two additional proofs, 1899. Marc Chagall (1887-1985) was a master of many mediums. Born in the Russian Empire (in present-day Belarus) into a Jewish family, Chagall first left for Saint Petersburg and eventually for Paris to study art, where he experienced the myriad art forms taking shape in the early twentieth century. Despite this early exposure to the many different schools of Modernism, Chagall’s art remained rooted in the spirituality of his Jewishness and the simple life of his upbringing in his native village. Lot 551: Marc Chagall, Four Tales from the Arabian Nights, Plate 9: Abdullah discovered before him and on his right and left mountains of water and solaced himself by gazing thereon and on the various sort of fish. Some of them favoured buffaloes, others oxen and others dogs and yet others human beings…, complete deluxe edition of 13 lithographs, Pantheon Books, New York, 1948. Four Tales from the Arabian Nights represents Chagall’s first foray into color lithography–up until then, he had created only 35 lithographs, all in black-and-white. 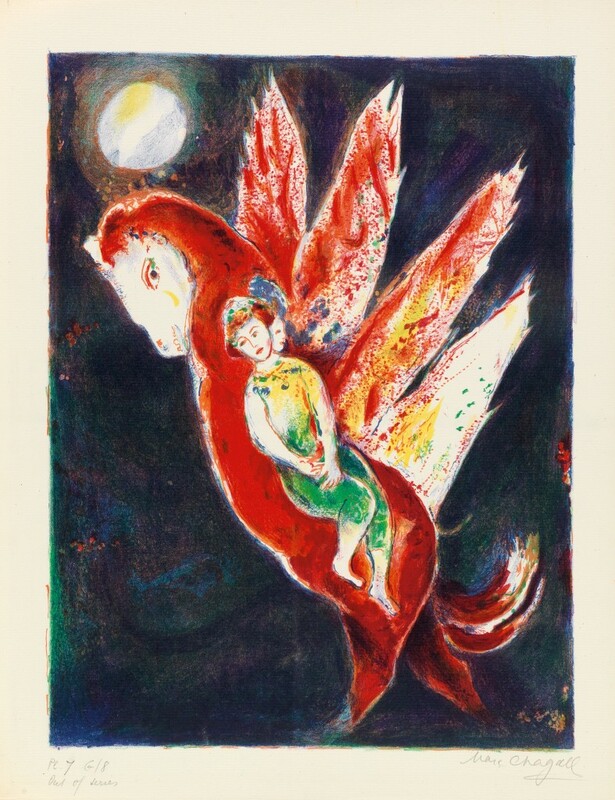 For Chagall, whose work so deeply depends on color, the epiphany of color lithography must have been monumental. The portfolio remains not only one of Chagall’s most cherished displays of the medium, but is a tour de force of color lithography in general and has been called the greatest example of the medium before 1950. With its soft, painterly quality, color lithography was ideal for Chagall’s whimsical and fluid compositions, and he continued producing it throughout the remainder of his life. Pantheon Books, New York, 1948. Estimate $250,000 to $350,000. The sale will offer other rare and important portfolios as well, including Unité, 1953, by Le Corbusier, and Salvador Dalí’s Florals, 1972. Browse the full catalogue for more.